Insulation is the material added to a building structure to reduce the heat transfer between inside and out. Because most structural materials are very dense, they are usually poor insulators, and most insulating materials are not dense, so they are not strong, hence most buildings are a combination of the two materials. There are however some materials of intermediate density that can be used as both: for example strawbale, cob, and ICFs, and as should be expected there are tradeoffs in all approaches. The amount of insulation that can be added is somewhat limited to the available space between the framing material, although increasingly rigid board insulation is added to the exterior (or sometimes interior) as well. Until someone invents a super insulator, high levels of insulation require somewhat thick walls, and in general a larger cavity than might be needed for structural reasons. Because the structural framing materials are generally an insulation liability, the overall R value of a wall will always be somewhat less than the R value of the insulation material--in some cases dramatically less1 (see heat loss calculation section to find how to calculate this). Needless to say, insulation requirements should be addressed when the structural framing is specified to ensure there is enough space for the required level of insulation. Avoiding thermal bridges (sections thru the wall/roof that have low insulation values because there is little or no insulation in them) is important for two reasons: first because they often reduce the R value of the whole wall significantly, and second because they may lead to condensation and mold (see the condensing potential section). In wood frame buildings, the term "advanced framing" (sometimes called optimum value engineering) refers to method of framing that reduces wood use and allows for increased insulation. Of the common structural materials (wood, steel and masonry), wood is the best, but is still a mediocre insulator. While it is common for structural members to span the entire thickness of a wall or ceiling, it is generally not a good idea. In the case of light gauge steel studs, its generally a terrible idea because steel conducts heat extremely well--in fact a steel framed wall will almost certainly have a lower R-value than a wood one2. A better approach is to use a double wall or exterior insulating board. In addition to structural materials, wires, pipes and ducts have low to no R-value, and so are best kept out of, or at least minimized in exterior walls. Since obstructions are the main cause of insulation voids, the R-value penalty for wires and pipes can easily be higher than is obvious. In other building methods, such as SIPs, ICFs, strawbale, rammed earth or adobe, the building structure also acts as the insulation (for more information on these see the Materials section). The high mass systems like adobe or rammed earth should either include additional insulation or be limited to climates that high thermal mass walls work well in. Fill: Material that you use to fill a cavity between structural materials (e.g. between wood or steel framing). Examples of these are loose fill fiberglass, cellulose, and spray in foam. The R-value of loose fill varies by the density it is filled to. Up to a point, higher density yields a higher R-value (more smaller air pockets), but beyond that the R-value starts to go down. The general advantage to fill material is that it conforms to the cavity size and shape (plus it flows around pipes, wires and other obstructions, while the disadvantage is that you often need mesh fabric to hold it in place (adding expense) and you have to worry about settling. Although fill insulation tends to have less voids than batts, they can still happen, particularly in retrofits. When installed properly at a high enough density, loose fill does not have problems with voids or settling. Batts: Material that holds itself together in a blanket like fashion, and is attached to structural framing. Batts come in various combinations of thickness and widths, the majority of which are designed around standard framing lumber and standard framing spacing (ie 3-1/2" by 15", or 5-1/2" by 23"). The general advantage of batts is usually cost, but because getting batts to fill every size and shape cavity in the building is a challenge, there are often voids. In particular when there are wires and pipes, it is very difficult to fit batts around them. Boards: A rigid material (typically some kind of plastic like polystyrene) that comes in sheets like plywood. Typical thickness are between 1/2 and 3 inches. Other materials that come in board form are: mineral wool, cork, fiberglass, although (as of 2016) they may be hard to find. There are many kinds of insulating materials, each of which has its own set of advantages and disadvantages, and none of which are the perfect solution. Not all insulation materials are appropriate for all situations. There is much information out there provided by manufactures of the various products, each listing their own benefits and the disadvantages of their competitors. As could be expected they are mostly very biased. A sampling of some web sites is included. at the end of this document. A quick note on "R" values of materials: Everywhere you look, you'll find somewhat different "R" values listed for the various materials. A materials "R" value will differ based on how it is manufactured (for example what gas is used to create foam board), and how it is installed (for example what density loose fill is installed at), whether the value is as installed or after many years (applicable to any material that breaks down over time, including foams whose insulation gas leaks out), and sometimes the difference between indoor and outdoor temperatures (particularly for batts or loose fill with large air spaces) and possibly other conditions as well. Due to the popularity of green building, manufacturers are changing their formulations at a fairly high rate. The numbers used here are typical and general the more pessimistic values, and should be used for relative comparison purposes only. Further discussion is in the section on R-values. Glass itself is a poor insulator, but it can encapsulate many small air spaces, which are good insulators. In fiberglass, the air gaps are created by many thin fibers of glass arranged in a disorderly way. Alternatively, glass can be formed into hollow beads and welded into board form, referred to as cellular glass insulation. Batts are the most common form of fiberglass, and are made by using a glue to hold the fibers in place. The traditional glue was phenol formaldehyde, a skin irritant, but most manufacturers have been switching over to a more benign glue since 2010. There is much controversy over the performance of fiberglass in real world situations (and in particular at cold temperatures), much of which appears to be misleading.3 What is clear is that fiberglass performs especially poorly when there is air infiltration--however buildings generally no longer have much air infiltration. Fiberglass batts have somewhat large air spaces, and hence suffer significant degradation of insulation value (up to 60% lower) at colder temperatures (below 20F) due to convection currents developing in those air spaces, and hence should be used with caution in any climate with the temperature regularly goes below 10F. The biggest drawback of batts isn't the large size of the air bubbles, but rather that is nearly impossible to install properly in the real world--not only are there gaps around wires, pipes, electrical boxes etc, but there can be gaps even when there are no obstacles. Batts often come with a paper or foil backing material which can make the product easy to install, but will change the moisture transport properties. See the moisture movement section for a complete discussion on vapor movement. Blown in fiberglass, comes in small cotton ball like shapes and is typically installed behind a fabric netting which is stapled to the studs (this is often referred to as BIBS (blown in batt system, although the name is apparently trademarked.). Alternatively it can also be installed thru holes drilled in either siding or interior walls. This form has no glue4, and has smaller air spaces. Fiberglass in is a good insulator, between R2.5 and R4.2 for every inch installed, depending on the density its installed at (unfortunately this results in different R-value being reported every place you look, its best to rely only on what the manufacturer says5, and assume that actual value is somewhat lower due to imperfect installation. The key is to install it at the rate they specify.). The highest values are achieved with blown in fiberglass packed fairly dense (anywhere from R3.5/in to R4.2./in), and the lowest values are for uncompressed loose fill (as in attic floors), which is more like R2.5/in. Batts are typically around R3.1 to R3.5/in. My limited experience is that the insulation value of blown in fiberglass in attics is often overstated: the R-value is determined by the amount of material installed per square foot, not the fresh fluffy depth, which settles over time. When blown in at the higher density, blown in fiberglass reduces air flow far more than fiberglass batts, although not as much as cellulose and neither are air barriers. Fiberglass doesn't rot or burn, and is not affect by insects. It has a high perm rating (ie allows much vapor transport), but no absorption ability (it will however hold quite a bit of liquid water). There is some concern that fiberglass fibers break down with age and create tiny sharp filaments causing a disease called silicosis. Virtually all cases of silicosis are job related. 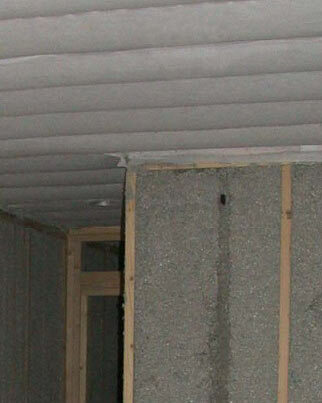 Although there is some real risk, that risk is very small because insulation is contained in the wall. Much information is available on the web, for example by entering "silicosis fiberglass" into any search engine. Manufacturers are beginning to include some recycled glass content in their fiberglass products, but currently old fiberglass insulation is difficult to recycle due to containing many contaminants. The raw material (sand) is readily available, and although glass manufacture requires a relatively large amount of energy, a long product life and recycling could mitigate that impact. also doesn't rot, isn't eaten by bugs and doesn't burn. The major difference is that it has significant compressive strength--enough to be put under a concrete slab--in fact is the only material besides extruded polystyrene that will do that. The tradeoff is that its much heavier and brittle (along with currently (2013) much more expensive). The R-value is around 3.4/in. The material is not new, but its use has mostly been in industrial settings. Unlike fiberglass, cellular glass has a perm rating of zero (ie no vapor transport at all). A fibrous product made out of various mineral byproducts (molten rock or slag waste from steel production), and all having similar properties to fiberglass. It comes as both a loose fill, and as a low density board. Loose fill mineral wool was common used on the 1940's and 50's, but has been nearly completely replaced by fiberglass. The loose fill version has no additives, while the board version is made with glue, typically phenol formaldehyde, the same glue in exterior grade plywood. Like fiberglass, mineral wool doesn't rot, isn't eating by insects and doesn't burn. It is also quite vapor permeable (perm rating greater than 10), also does not store vapor, but will will store quite a lot of liquid water. The loose fill version has a similar R-value to loose fill fiberglass (that is somewhere in the vicinity of R 3.5 to R3.7, and with the same caveats about density), while the board version runs closer to R4 to R4.2. Some mineral wool has "recycled" content (ie its an industrial byproduct), but the insulation itself is not typically recyclable. It is however, essentially just rock, so it can be disposed of easily. Most mineral wool is used in commercial buildings, while the board version, particularly the most dense board, are being used in green buildings as a replacement for plastic foam board, although mineral wool does not have the compressive strength to be used below grade. The environmental advantage is that mineral wool board does not contain the potentially toxic fire and insect retardants that are put into foam board, nor it is derived from petrochemicals, the downside is that it has a less than totally benign binder. Typically made of shredded recycled paper (mostly newspaper) soaked in a solution borates (related to borax cleaning powder) to increase its fire resistance and insect resistance. Its R-value is usually given as around 3.7, but that value depends on a somewhat dense installation. Cellulose is either blown into a cavity dry, or sprayed on wet (when using wet spray, make sure the insulation dries completely!). Wet spray is limited to 2x6 walls (it falls out in thicker walls), and can't be used in ceilings. Using a fabric, blowing in dry until slightly overstuffed is likely to get the best R-value and avoids any moisture problems, but costs more. Any liquid water (condensation or whatever) in the wall may leach out the borates over time leaving the insulation vulnerable, but liquid water, or for that matter high moisture content will cause the wood framing to mold first. Although borates are considered safe, some people are sensitive, so anyone who has chemical sensitivities needs to find out is they are susceptible before using cellulose. Cellulose is vapor permeable (perm rating greater than 10), and can also store quiet a bit of vapor before its moisture content leads to rot. Cellulose is a 100% recycled product, but it not recyclable due to contaminants and the breakdown of fibers. It is however completely biodegrading, and the original product is a renewable resource. Its manufacture is a relatively low energy process, although until manufactures eliminate chlorine bleaching, there are dioxins produced. For a theoretically benign product, it's very dusty and not pleasant to install. Plastic foam (general): This includes Polystyrene, Polyurethane, Polyisocyanurate, and Phenolic foam. These are various kinds of plastic, all generally made from petroleum (fossil fuel), each using various kinds of blowing agents (to form gas bubbles), and often including some kind of fire retardant. Unfortunately is very difficult to find out what blowing agent and what (if any) fire retardant is used in a given board stock product, and further, due to consumer pressure (as well as the EPA), manufactures change their products somewhat frequently. Unfortunately it means that the following info may not be fully accurate. Polystyrene is a plastic (known mostly by the brand name "Styrofoam") is made from petroleum that is "blown" with some kind of gas (i.e. filled with lots of bubbles) and formed into boards. Historically the gas used was either a CFC of HCFC, materials that are greenhouse gases and contribute to ozone depletion. While there has been a switch toward more benign blowing agents, XPS (the most commonly used polystyrene) is still blown (2016) with some kind of HCFC. There is promise that there will be a switch to HFO (hydrofluoroolefin) but that transition appears to be going slowly. There are at least three different kinds of polystyrene: molded expanded (MEPS), expanded (EPS), and extruded (XPS). EPS is typically white with visible grains. XPS is typically blue or pink and quite smooth. The R-value of the EPS variety varies from 3.5 to 4.5 per inch, while the XPS variety is around R5/inch. The higher R-value for extruded polystyrene is because it is blown with HCFCs and has smaller bubble size. The blowing agents have a tendency to leak out of the polystyrene over time, hence the R-value/inch, particularly of CFC and HCFC blown boards are lower many years down the line, so use the "aged" R-value instead of the more commonly stated R-value as manufactured. Polystyrene by itself is highly flammable, and contains fire retardants, which currently are PDBE (Polybrominated diphenyl ether). These compounds have come under scrutiny for a variety of health concerns. Since most polystyrene is installed behind a fire rated assembly (drywall, fiber cement siding, brick etc), it is unclear that the fire retardants have any advantage. The material still burns and now produces more toxic smoke when it does. Since its generally installed on the exterior, it is not considered an indoor air quality issue. Bugs (termites and carpenter ants) like to tunnel thru polystyrene, so some versions of it contain bug retardants (apparently mostly EPS), but most do not. When bugs are a problem, use a version with retardants, or better yet, physical barriers and avoid ground contact. Note that in some regions, rigid plastic foam is prohibited on the exterior due to bug problems. Both XPS & EPS tends to degrade in the sun, so they should be protected. EPS will also degrade if it exposed to freeze-thaw cycles. EPS board is quite vapor permeable (2-5 perms depending on density, the common material is low density, hence most of it closer to 5 perms/1 inch), and will hold quite a bit of water, but XPS is only moderately permeable (around 1perm for 1" thick, less for thicker) and holds little water. Polystyrene, like all plastics expands and contracts with temperature, but how much isn't clear. There are examples of foam board that has shrunk over time, but manufacturers claim this is no longer the case. The safest bet is probably to put the weather (water) barrier under the foam board. Green builders don't tend to like foam board6, because its derived from petroleum (although theoretically it could be other organic materials since its just polymerized styrene, there are many barriers to doing so), because of the high green house gas factor of the blowing agents, and because of the fire retardants that are added. Manufacturers have been moving toward more benign blowing agents, and there is now a push to remove fire retardants from at least some of the foam board (although even if the building code is changed to allow it, its not clear the manufactures will provide the product). That said, plastic foam board dominated the insulation board market, and has higher R-values than any competing product. Currently EPS Polystyrene is the main component of SIP and ICF building systems (see Materials), and XPS, due to the high compressive strength, it is used almost exclusively below grade (but see also cellular glass above). It is also sometimes used on roofs, walls and in other places where its board form is more convenient--especially XPS, because it can be a vapor barrier as well. Although technically possible to recycle (its a thermoplastic, meaning it can melted and reformed) hardly anyone will even take clean Styrofoam packing material, so dirty old insulation is even less likely. Installing foil faced polysio in a basement. Like Polystyrene, this is a plastic rigid board insulation blown with a gas, but promising a higher "R" value: claims range from R6 to R8, although these generally are not "aged" values. While previously products used CFCs/HCFCs, currently most manufacturers use Pentane instead. It also appears that with this adoption, the R-value of polyiso is now given as an aged value of R6/inch, or R6.5; since aged values are an average, the difference is probably due to the expected lifetime. Polyiso generally comes with a facing on both sides, either paper or foil because it is manufactured by spraying a foam between the backing layers. Polyiso by itself is highly flammable, and generally contains fire retardants, which currently are PDBE (Polybrominated diphenyl ether). These compounds have come under scrutiny for a variety of health concerns. Since most polyiso is installed behind a fire rated assembly (drywall, fiber cement siding, brick etc), it is unclear that the fire retardants have any advantage. The material still burns and now produces more toxic smoke when it does. Since its generally installed on the exterior, it is not considered an indoor air quality issue. Bugs (termites, carpenter ants) will tunnel thru polyiso, so if carpenter ants or termites are common, a physical barrier such as a termite shield is necessary. Foil face polyiso can act as a weather barrier (it needs to be protected from sun), but because it may move with temperature and may shrink over time, most current best practices recommend installing a housewrap or equivalent drainage plane behind any exterior foam where overlap can be used for seams. Polyiso is a thermoset, closed cell foam with medium vapor permeability( 3-4.5) , however since it is manufactured by putting it on a substrate like foil, its perm rating in that case is determined by the foil, which is very low (.05 or less). It also supposedly low water absorption, but anecdotal evidence is that it will hold some water. Because its thermoset, it can't be melted and remade, so its not recyclable. 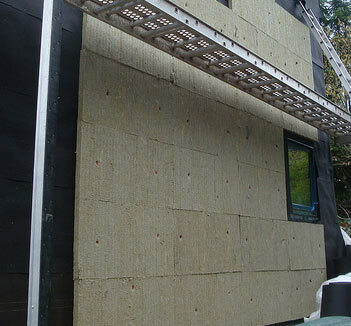 Because of its high R-value, and lack of HCFCs, and low water absorption, green builders prefer Polyiso to polystyrene for above ground applications. The downsides are that its derived from oil, some of the chemical ingredients are potentially toxic, and that it contains a fire retardant that is a chemical of concern for human health. 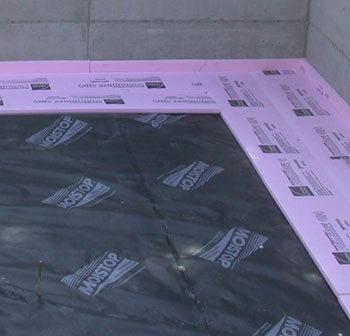 Polyiso is does not have enough compressive strength to be used below grade. Polyurethane is very closely related to polyiso, but comes in a wider range of products using various blowing agents, and hence has more varying R-values. The open cell form is less dense and has lower R-value (down around 3.5/inch), while the closed cell form has higher values (up to R6.7). In open cell foam the gas bubbles ("cells") are mostly connected to each other (hence "open cell"), while in closed cell the gas bubbles are isolated from either other. Open cell foam uses water as a blowing agent (the water reacts to produce CO2 bubbles), while closed cell foam are usually blown with HCFCs--however some manufacturers have switched to HFOs. In fact, spray foam manufactures appear to be the first to move to HFO (polyolefin) blowing agents, leading to slightly higher R-values and dramatically lower global warming potential. Most polyurethane is installed as spray foam, although a board version similar to Polyiso board is also available (ie it was manufactured with some kind of face material). Polyurethane by itself is highly flammable, and contains fire retardants, which currently are PDBE (Polybrominated diphenyl ether). These compounds have come under scrutiny for a variety of health concerns. Since most polyurethane is installed behind a fire rated assembly (drywall, fiber cement siding, brick etc), it is unclear that the fire retardants have any advantage. The material still burns and now produces more toxic smoke when it does. Since its generally installed on the exterior, it is not considered an indoor air quality issue. Polyurethane spray foam is created from hazardous chemicals and must be installed with a respirator. It apparently off-gases for some time after install, and some people have had adverse reactions to it. Bugs (termites, carpenter ants) will tunnel thru polyurethane, so if carpenter ants or termites are common, a physical barrier such as a termite shield is necessary. Polyurethane, being a plastic will shrink and expand with temperature, and there is some concern that it shrink over time. This applies to spray foam as well, enough though it adheres to wood quite strongly. Spray foam is a strong glue, so using spray foam will make later salvage of building materials difficult. Open cell foam is quite vapor permeable (perm rating greater than 10), while closed cell has a much lower rating (often less than 1), although note that these are for some assumed thickness. Open cell foam has a perm rating of 30+/inch, while closed cell is more in the 1.5-3/inch range, and of course all depending on the particular product. Polyurethanes are generally thermosetting plastics, meaning they can't be melted and reused, so they are not generally recyclable. Both open and closed cell spray foams are very good air barriers (open cell requires a greater thickness to be the same air barrier as closed cell), and polyurethane spray foam is used more often as an air sealant than as just insulation. Most cans of spray foam available at the local hardware store are closed cell polyurethane, but without the HCFC blowing agent (with an R-value in the 4-5 range). There is some question as to the longevity of the air seal created by spray foam. Both of these products are thermosetting, meaning that one made they can't be melted and reformed, so they are not easily recycled. While polyurethane spray foam was popular for its high insulation value and air sealing ability, most green builders have turned to other products, although some still install a small layer of polyurethane against the sheathing, and then loose fill for the rest of the cavity. Advanced tapes that are applied to sheathing joints are starting to take over the air sealing job. Environmentally, polyurethane isn't a preferred product due to being made from petroleum, being made from potentially toxic chemicals, for containing potentially toxic flame retardants, and for often having HCFC blowing agents. In the case of HCFCs, their global warming potential is so high, that studies have shown them to be a net-negative in most situations. This is essentially Bakelite, a hard thermoset plastic that has been blown full of little bubbles, likely using pentane as the blowing agent. The bubbles are quite small, so Phenolic foam has the highest R-value per inch of any plastic insulation--around R8. Unlike other foams, the R-value does not degrade over time. Due to its high flame point, it also comes without flame retardants. 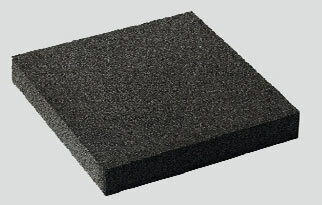 Phenolic foam comes in various densities as both open cell and closed cell versions. The closed cell will have the higher R-value. It has low water absorption and generally a low vapor permeance (and so will prevent drying to whatever side its placed on). While this insulation is readily available in Europe, its not commonly available in the US, having just been re-introduced (2016). It was previously withdrawn due to problems with degrading any metal it contacted, which was due to residual acids left over from manufacture. Air Crete: This unique product is cement with a lot of air in it, installed as a foam. The market is currently quite small, so it is not readily available. Its "R" value is similar to fiberglass, but it has all the environmental properties of cement (and therefore does not have problems with silicosis). Its raw materials are abundant, but it takes a lot of energy to make it. It is apparently quite friable, and may be prone to settling. Its is recyclable, but there is currently not a strong market for cement products. Cotton: Made of waste cotton (typically industrial waste, not post-consumer), cotton insulation is a product that has limited availability and currently a significantly higher cost. Because it is a plant material containing cellulose, its properties and problems are like those for Cellulose, the main difference is that it typically comes in batts rather than loose fill. Others: Cork can be made into boards using steam and no glue with an R-value of around 3.5. Its a renewable resource grown mainly in Portugal, and hence is likely to remain a niche product. Wool can be used instead of cotton and has some advantages in that its naturally fire retardant, naturally resistant to rot and can absorb quite a bit of moisture and retain its R-value (but your wood framing will mold anyhow). Like cotton it comes in batts. www.eeba.com - the energy efficient building association, publishers of the "Builders Guild" series of construction manuals. www.buildinggreen.com - web site of Environmental Building News, an authoritative, independent reviewer of Green Building. Alas, much of the information is only available if you subscribe to the on-line version of GreenSpec. www.certainteed.com - Makers of Insulsafe 4, a "glue free" fiberglass loose fill. 1. I think I repeat this a bit too often, but also I think its for good reason. 2. This isn't to say isn't is possible: but you'd have to use significantly less framing material to compensate for its effectively zero R-value. 3: The literature is filled with claims that fiberglass performs very poorly in real world situations.--in fact it's so pervasive that earlier versions of this site repeated it to some degree. As far as I can tell, most of this is from the proponents of spray foam. It is apparently true the low density fiberglass will have convection current at low temperature, but what is not clear about this is that the standard R-value test is done at low temperature, hence any effect is already contained in the stated R-value. Further, this effect does not apply to denser versions of fiberglass, although those making the claims treat fiberglass as if there were only one version of it. The larger historical factor in R-value degradation would be due to air infiltration. 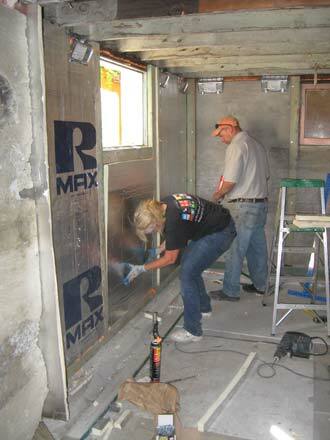 In this case, because air passes readily thru fiberglass, and since the R-value of the insulation is due to that air not moving, air infiltration can render the product nearly useless. No one builds leaky houses any more, so this claim is also moot. 4: whether there is actually glue in loose fill fiberglass or not isn't really clear to me, but either way it feels like the fake cotton they stuff vitamin bottles with. There may still be an issue with low density loose fill, but given that the higher density is also a slightly higher R-value, there appears to be no reason for the lower density, other than maybe cost. There is also an issue with batts poorly fitting into odd size/shape spaces between studs or joists, but that is a separate problem. 5. That includes treating my numbers as gospel, although I think they're pretty darn close! 6: insulation choice among green builders can be like a religious discussion. All products have their pluses & minus, and so I'm specifically avoiding taking a stand, other than "insulation is good".